2.He is the god of the war. 3.Symbol: The symbol of Ares was the spear and his sacred animal was the dog. 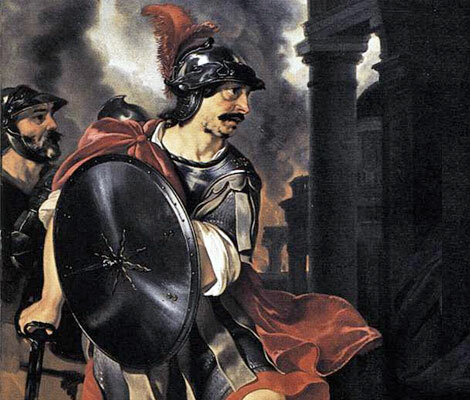 4.Personality of Ares: Just like his mother Hera, Ares had a very difficult character to deal with and was therefore rather unpopular among the other deities and mankind. For this reason, no Greek city wanted to have him as its patron. He often had conflicts and fights with his half-sisters Artemis and Athena, especially during the Trojan War. 5.Ares’ secret mistress was Aphrodite, the goddess of love and beauty. 6.Childrens: Among Ares’ children with Aphrodite were Himeros(desire), Pothos(desire), Phobos(fear), Deimos(terror), Armonia(harmony), Eros(love) and Anteros(mutual love). Ares also had one with Aglaulus called Alcippe, who was raped by Allirothios, a son of Poseidon.